The Duel Monsters Spirit World (デュエルモンスターズの精霊世界 Dyueru Monsutāzu no Seirei Sekai) is the series of connected alternate dimensions inhabited by Duel Monster Spirits. Its connection to the real world is unclear, but humans have been shown capable of summoning these spirits to Earth in different ways, with the spirits sometimes even representing their souls. Some humans have ended up presiding within it after their death, by fusing with a Duel Monster (leading to the creation of monsters such as Dark Magician). Regardless of its ambiguousness in its relationship to Earth, and whether or not the different Spirit Worlds within the different Yu-Gi-Oh! series are related to each other within the same canon, it takes on a prominent role in the first three NAS Yu-Gi-Oh! animes. In Yu-Gi-Oh! GX, Nightshroud claims that the spirits of Duel Monsters are from the origin of the world. He claims that when the universe began, it split into darkness and light. (Assuming the canons of the different series are consistent, it is unknown if this was the result of the Numeron Dragon, from Yu-Gi-Oh! ZEXAL, creating the universe). Nightshroud states that as the light vanished, the darkness filled the universe and created everything in the world, including life. Nightshroud uses a single card as a metaphor for the origins of the world (this card having a relation to the Numeron Code from ZEXAL, or even being the Code itself, is possible but unconfirmed). The front of the card represented the human world and the Duel Monsters Spirit World (although how these worlds came into being was never stated in detail), while the other side of the card was the World of Darkness. After humans came into existence, they inevitably discovered the Duel Monsters. According to Nightshroud, Duel Monsters became a touchstone to test their souls. The impact that different gods in the series, such as the Egyptian Gods, the Crimson Dragon, and the Aesir, had on the origins of these different spirit worlds is unknown, but these deities are shown to take agency on Earth when they are summoned by Duelists. Temple found by Ironheart to summon the Duel Monsters. Duel monsters were first discovered by the humans in the ancient city of Atlantis, 10,000 years before the start of the series. When its monarch Dartz tried to destroy the world with an army of Orichalcos Soldiers, his father, Ironheart, opposed him. He went to a temple and requested the assistance of the Duel Monster Spirits, which they agreed to lend. After the engagement known as the Battle of the Stone Wasteland, The Great Leviathan was defeated by Ironheart's army. Before his death, Ironheart sealed the gateway to the Duel Monsters Spirit World, leaving behind their spirits scattered across the planet. Some were left in the Egyptian pyramids, the Greek temples, the Aztec pyramids, the Egyptian mastabas. Dartz survived, and began wandering the Earth gathering souls using the Orichalchos to revive The Great Leviathan to destroy and reconstruct both the Human World and the Duel Monsters Spirit World in his own image. The seal Ironheart had put to the Duel Monsters Spirit World was broken in ancient Egypt, 3,000 years (5,000 in the English version) before the start of the series. The Egyptians used stone tablets to seal the Duel Monster Spirits and summon them to fight battles. The Egyptians harnessed the power of the Duel Spirits for use in their Shadow Games. It is implied that Duel Spirits were the basis for the Egyptian concepts of ka and ba. These events were recorded in the Book of Thoth and was passed from generation to generation. These events caused Dartz to become interested again in destroying both worlds. He needed the soul of Atem to do so, however, the pharaoh disappeared. 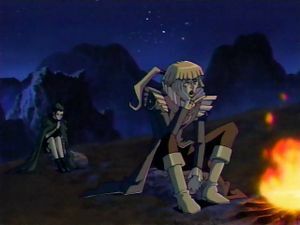 Dartz believed that Atem is the one that should put an end to human and Duel Monsters history though Dartz could not capture the Pharaoh's soul because Bandit King Bakura and Zorc Necrophades opposed him. Julius Caesar, leader of the ancient Roman Empire, gathered seven gems from across the world to show his authority. However, they were lost on their way back to Rome in a ship wreckage. Caesar also held control of the tablet of the Rainbow Dragon and he hid it from everyone. These artifacts are used to summon the Duel Spirits of the Crystal Beasts. The events of ancient Egypt eventually inspired the creation of the tarot cards and all other card games. Maximillion Pegasus discovered the Duel Monsters, the origin of the world, in the Valley of the Kings 7 years before the start of the series and created the Duel Monsters' card game from it. He created them in order to bring the ancient Egyptian battles to modern times. By creating the cards, he unknowingly created a gate that connects the human world and the Duel Monsters Spirit World. Seto Kaiba's brief encounter with the world of the Duel Spirits. The first mention of the world occurs after Kaiba lost a Duel to Dark Yugi. Kaiba suffered the Experience of Death Penalty Game, where he believed he was sent to the world of Duel Monsters by being imprisoned in a card. There he was menaced by Duel Spirits such as "Blackland Fire Dragon", "Mameda", "Jellome", and "Lion". This was the first Shadow Duel, and it involved the summoning of the real Duel Monsters as the pictures of the card materialized. The monsters could also make their own decisions such as the Blue Eyes White Dragon decided not to attack Yugi and self-destruct. This incident inspires Kaiba to create his hologram technology of Duel Boxes. 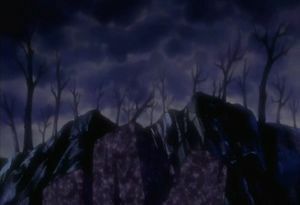 The dimension the two Yugis appeared in. The first appearance of the Duel Monsters Spirit World in the second series anime is in Bakura's Duel with Yami Yugi during the Duelist Kingdom arc. The monsters that were destroyed were sent to a graveyard type dimension of the spirit world where the Reaper of the Cards lives and will try to claim their souls. It is even accessed when Yami Bakura sent Pegasus' men there outside of a Duel. The Waking the Dragons arc was the first to establish that Duel Spirits have their own society. Yugi, Kaiba, and Joey Wheeler each visit the world to unlock their respective Legendary Dragons. The portion of the dimension they visit, called the Dominion of the Beasts, includes a large, medieval-style castle, with a vast forest nearby as well as a floating island. There, they meet many small monsters, especially Fairy-Types, all of whom appear battered and weary from their battles with the Great Leviathan. This group appears to be led by Dark Magician Girl. In addition, many Duel Spirits escaped to the human world during the Orichalcos crisis, perhaps fleeing the Leviathan's wrath upon their home dimensions. 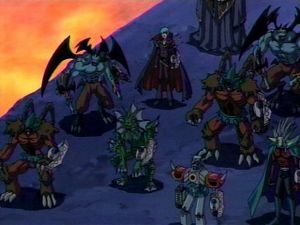 The Spirit World figures most prominently in GX, where it is the primary setting of the third season. This series establishes that there are eleven Duel Spirit Dimensions, each accessible from both the others and the human world. 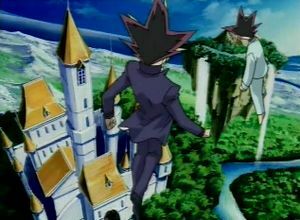 As a result of Yubel's actions in the third season, these dimensions were slowly converging into each other, threatening to destroy one another until Jaden's fusion with Yubel undid the entire ordeal. The first one seen is a ruins-based area where the Gravekeeper's Chief and his tribe resided. What may be the same Fairy-inhabited dimension from Duel Monsters appears when Jaden is transported to an underground blue cave where he encounters the spirit of Kaibaman and is defeated by him in a Duel. Many of the same inhabitants of that dimension appear as spectators of the Duel. The Duel Spirits' forces do battle with the Light of Destruction's invading army. 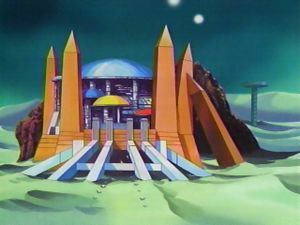 Neo Space is introduced as one of the dimensions early in the second season. 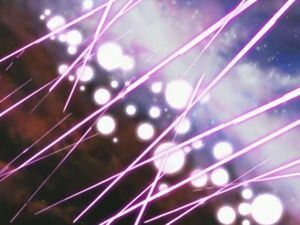 Jaden travels there and finds that it is under siege from an extradimensional entity known as the Light of Destruction, which does not appear to hail from any of the Duel Spirit Dimensions and seeks to dominate them. Jaden defeats one of the Light's soldiers here and receives his second Deck, mainly comprised of monsters he designed for a contest as a child. Later, it is revealed that Jaden's past life was to become the Supreme King of this dimension, as he wielded the Darkness of Justice, the only weapon that could defeat the Light. The young man's best friend, Yubel, was transformed into a monster herself to protect him until he came of age. Duel Academy arrives in the desert dimension. In the third season, Yubel, herself tainted by the Light and possessing Marcel, transports Duel Academy to another of the dimensions, a vast desert. Yubel, through Marcel, could call the inhabitants of this dimension, such as Titan, the Rock Spirit, Sand Stone, and Sand Moth, to her aid through her special Duel Disk. Jesse Anderson sacrifices himself to get Duel Academy back to Earth. To save Jesse, Jaden and his friends venture to the Spirit World again, this time into the Dark World, inhabited mostly be Fiend-Type monsters and lorded over by Brron. Brron's regime is opposed by Warrior-Type rebels such as Freed the Brave Wanderer, Total Defense Shogun, and Field-Commander Rahz. The Dark World is also home to an icy area in which lower-Level Fiends and Fairies are oppressed by mid-Level Winged-Beasts led by Sky Scout. After Brron is defeated by Jaden, Jaden is in turn possessed by the demented spirit of his past life and rules as the Supreme King of the Dark World for a short time. The one who would lose a Duel there, were believed to have died. But they were actually sent to an empty, dark and cold dimension. As they were captured there, Yubel used to drain their energy in order to recover fully herself. This place was referred as "the hell" or "the underworld" in the Japanese version. Dr. Crowler and Echo in the rocky wasteland dimension. The final dimension visited, accessed through a gate in the icy area of the Dark World, is a desolate-appearing region full of imposing rocky outcroppings. Many of the more legendary monsters, such as Exodia the Forbidden One and the Sacred Beasts, are kept here, heavily guarded. Yubel's castle was constructed here, and it is here that she has her final confrontation with Jaden. She divulges her connection to Brron and their plan to turn Jaden into an evil Supreme King to rule alongside Yubel. With that plan failing, Yubel attempts to Summons "Super Fusion God", intending to fuse all twelve dimensions together and be united with Jaden in death, but is stopped by Jaden, who fuses himself with Yubel and purges her of the Light of Destruction once and for all. 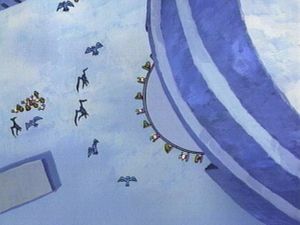 While Honest was explaining the upcoming threat in episode 160, a scene features the dimension from the second series where the Legendary Dragons were held. Honest reveals that the "World of Darkness" has appeared in one of the Duel Monster dimensions and is slowly consuming it. In 5D's, another Duel Spirits' World is linked to Luna's mind. Luna lapsed into a coma at the age of three and awoke in the Ancient Forest, where she lived among the Fairy-type monsters under the protection of Ancient Fairy Dragon. After she woke, a great evil, the Minus Curse, struck the Forest, imprisoning the monsters within stone and transforming the Forest into the desolate Minus World. Luna's connection to the Spirit World was reestablished during her Duel with Professor Frank. The demented counselor put both Luna and himself into trances, allowing them to access the spirit world. Aside from monsters played by Luna or Frank, the Ancient Forest was bereft of life, and much of it was turned to stone, including Ancient Fairy Dragon, who was found fossilized in a cliff face. Luna returned to reality after the curse ended. Later, Luna transfers into the Spirit World again (this time body as well due to Regulus casting a spell to bring her there), this time to free it from the Minus Curse. She visits the town Schwank, which gets invaded by the monkey troop, searching for spirits. Joined by Torunka, a de-aged "Dark Sage" spirit, Luna tracked down Regulus, Ancient Fairy Dragon's servant, in the Forest of Pojar. Luna, Torunka, and Regulus invaded the castle of Zeman the Ape King, the chief facilitator of the Minus Curse and underling of the Dark Signer Devack. The Minus Curse is finally lifted with Devack's defeat, and as a reward, Luna receives cards for both "Ancient Fairy Dragon" and "Regulus". In Yu-Gi-Oh! 5D's World Championship 2011: Over the Nexus, the Spirit World can be accessed through a door at the fountain square. The player unlocked the door by defeating Team 5D's, Team New World and Team Satisfaction on the PCs in Yusei's garage, the stadium and the fake shop respectively. Misaki wanted to see a lion, so the player took her here to see Regulus. ↑ 1.0 1.1 1.2 1.3 Yu-Gi-Oh! GX episode 177: "Combo of Terror! "Zero and Infinity""
↑ 2.0 2.1 Yu-Gi-Oh! GX episode 155: "Return of the Supreme King, Part 3"
↑ Yu-Gi-Oh! ZEXAL episode 89: "Darkness Dawns"
↑ 6.0 6.1 Yu-Gi-Oh! episode 180: "A Duel with Dartz - Part 4"
↑ Yu-Gi-Oh! GX episode 106: "A Jewel of A Duel: Part 1"
↑ Yu-Gi-Oh! GX episode 127: "Breaking of the Sacred Seal"
↑ Yu-Gi-Oh! GX episode 116: "Trapper Keeper, Part 2"
↑ Yu-Gi-Oh! GX episode 160: "Fused Souls! Neos Versus Five-Headed Dragon"
↑ Yu-Gi-Oh! Duel 10: "The Cards with Teeth (Part 2)"
↑ Yu-Gi-Oh! Duel 9: "The Cards with Teeth (Part 1)"
↑ Yu-Gi-Oh! episode 013: "Evil Spirit of the Ring"
↑ Yu-Gi-Oh! episode 037: "Yugi vs. Pegasus: Match of the Millennium, Part 3"
This page was last edited on 27 October 2018, at 02:15.